The Military Doesn't Advertise It, But U.S. Troops Are All Over Africa : Parallels The U.S. military has some 20 missions across the continent. Most are for training African armies not combat. But there are risks as U.S. troops venture into the field. 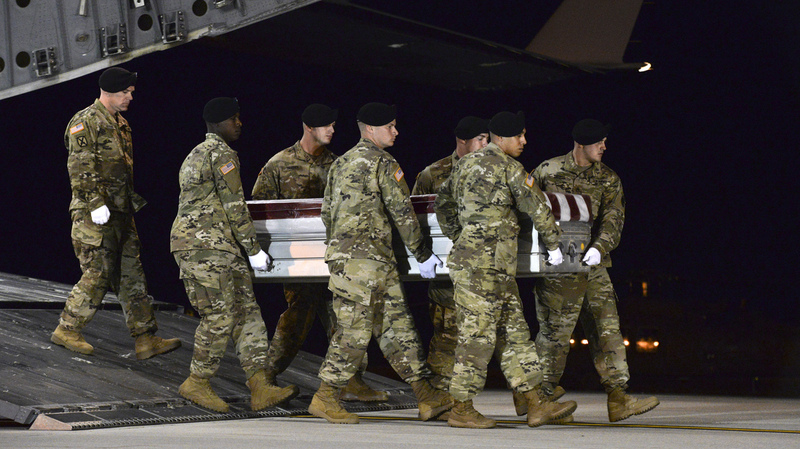 A U.S. Army team transfers the remains of Staff Sgt. Dustin Wright, 29, of Lyons, Ga., at Dover Air Force Base, Del., on Oct. 5. Wright was one of four U.S. troops killed in an ambush in Niger. Yet in many ways, the Niger operation typifies U.S. military missions underway in roughly 20 African countries, mostly in the northern half of the continent. The missions tend to be small, they are carried out largely below the radar, and most are focused on a specific aim: rolling back Islamist extremism. "The missions are different, but obviously if they're out in a high-threat environment, they're going to be prepared for combat as a contingency," said Dan Hampton, a retired Army colonel at the Africa Center for Strategic Studies, a think tank sponsored by the Defense Department. "It's hard to say it's not a combat mission when there's the potential for conflict and combat as they accompany these African troops," he said. In Niger, a dozen U.S. troops traveled with members of the nation's military to meet villagers in a remote southwestern corner of the country, near the border with Mali. The entire contingent was ambushed as it was leaving. Four Americans were killed and two were wounded, and five Nigerien troops were also killed. A Pentagon investigation has found that a series of missteps left the Americans exposed and vulnerable. It has sent the classified report to Congress, and military officers have started to brief the families of the soldiers who were killed. The report has not been released publicly, but an official who has seen it described it to NPR Pentagon correspondent Tom Bowman. The U.S. military established its Africa Command, AFRICOM, in 2007, in an effort to work more closely with African militaries that were often ill-equipped to deal with emerging extremist threats. While many African countries welcome the U.S. assistance, they usually aren't interested in a high-profile U.S. presence. AFRICOM headquarters are in Stuttgart, Germany, and not in Africa. "The focus of the U.S. military operations is basically 'African solutions for African problems,' " said John Campbell, who follows Africa for the Council on Foreign Relations. "What that means is developing the indigenous capacity to respond to security threats." President Barack Obama sent the U.S. forces to Niger in 2013, a time when extremists were on the rise in northwestern Africa. Boko Haram was on the march in Nigeria, Niger's neighbor to the south. Radicals aligned with al-Qaida had taken over large parts of Mali, Niger's neighbor to the west. Borders mean little in this region. The area has a long history as a trade and smuggling route that connects sub-Saharan Africa with North Africa and troubled countries like Libya — Niger's neighbor to the north. Defense Secretary Jim Mattis said the U.S. military has more than 1,000 personnel in the region, an apparent reference to an area that includes Niger as well as Mali and Nigeria. No group has claimed responsibility for the attack in Niger, though Mattis did refer to the Islamic State. Mattis described the mission as "supporting the French-led and the African troops, in the campaign to throw ISIS and the terrorists, the radicals, those who foment instability and murder and mayhem, off their stride." The U.S., he added, was largely helping with intelligence and surveillance. The U.S. reportedly has one drone base in Niger and is working on a second one. Uganda: The U.S. military launched a search in 2011 for rebel leader Joseph Kony, whose Lord's Resistance Army had terrorized Uganda and neighboring states for years. The U.S. efforts have help weaken the group. But Kony remains at large and the search has wound down. Somalia: The American military charged into the East African nation in 1992 and helped end a famine but became entangled in the country's civil war. The U.S. is now working with the military in its fight against al-Shabab militants. Djibouti: This tiny nation hosts the only permanent U.S. military base in Africa, though the Americans here tend to focus more on the turbulence in the nearby Persian Gulf. Libya: The U.S. has carried out periodic drone strikes as part of a campaign aimed at the Islamic State and other extremists in the war-ravaged country.